DALLAS -- The Dallas Stars have signed defenseman Johnny Oduya to a two-year contract, the team announced Wednesday. Oduya will make an average of $3.75 million annually, sources told ESPN.com's Pierre LeBrun. The deal also includes a partial no-trade clause, sources told ESPN.com's Craig Custance. The 33-year-old Oduya won two Stanley Cups with the Chicago Blackhawks since being acquired from the then-Atlanta Thrashers on Feb. 27, 2012. "Johnny is a steady, veteran presence on the blue line, and he'll complement our group nicely," Stars general manager Jim Nill said. "He has achieved a great deal of success, winning the Stanley Cup twice, and his championship mentality will be valuable in our room." The Swedish defenseman had the worst statistical season of his Chicago tenure in 2014-15 with only 10 points and a plus-5 rating in 76 regular-season games. Oduya's ice time spiked in the 2015 playoffs to 24 minutes, 45 seconds, but his production remained flat. Oduya's signing comes five days after the Blackhawks traded forward Patrick Sharp and defenseman Stephen Johns to the Dallas Stars for defenseman Trevor Daley and forward Ryan Garbutt on Friday. Sharp, 33, had been with the Blackhawks since 2005, winning three Stanley Cups. He had 239 goals and 272 assists in 679 games for the Chicago. He had 16 goals and 27 assists in 68 games last season. 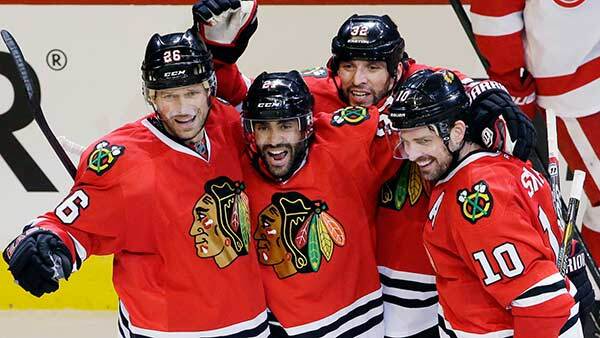 During the Blackhawks' 2013 march to the Stanley Cup title, Oduya had a plus-12 rating and eight points in 23 games. Oduya announced after the Blackhawks won the Stanley Cup that he played through a tear in his left elbow that he suffered in Game 3 of the series. The 2001 seventh-round draft pick finished a three-year, $10.12 million contract signed with the Blackhawks in the offseason following his trade to the team.